Powder skiing through Wombat Valley, Mt Buller. 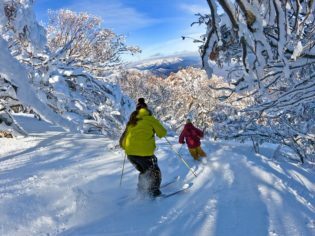 Mt Buller is a winter satellite of Melbourne’s social scene, making this perhaps Australia’s most vivacious après village. Thanks to the largest lift network in Victoria, the AM action is solid too, especially for free-riders and snowboarders. Buller embraces the freestyle philosophy, with plenty of opportunities to show off among its 300 hectares (and 22 lifts), including Skyline Park for those wanting to play Winter X Games-style. Mt Buller ski and snowboard school in session. Intermediates should sample the distinctly un-standard Standard run for its length, breadth and off-shoots. Head to the Summit chair for that bluebird-day Instagram moment. In the heart of the village the Mt Buller Chalet Hotel & Suites’ two-king Delatite Suite yields supreme top-floor High Country vistas, plus an antique grizzly bear. The Duck Inn’s recent makeover makes it a contemporary choice in a ‘quiet’ neck of town. Ski-in options abound from the sauna-equipped AMO Lodge to the Austrian-style Buller ‘institution’ Hotel Pension Grimus. Sample a Pony Iced Tea at intimate fireside cocktails favourite Snow Pony. Powder Bar in Village Square purveys fine Euro-style snacks and craft beer, plus a cultured range of local vino. Breathtaker Hotel will keep the family distracted; a massage at the loftiest spa in Australia for mum, while the rest of the fam head to The Loft Bar for pizza and films on beanbags. 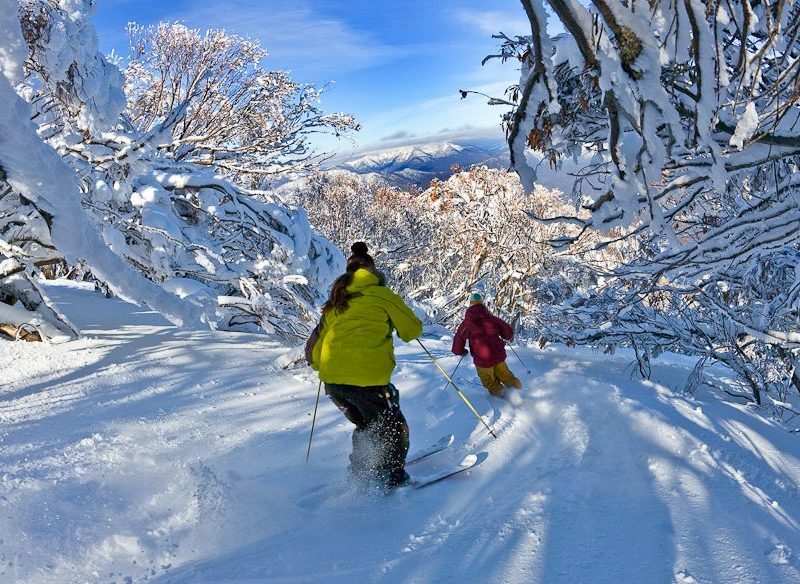 Mt Buller is three hours’ drive from Melbourne and the Mt Buller Ski Express connects from downtown Melbourne and the airport. Mansfield is the place to hire gear and chains. You can find your friends on the slopes using the Glympse feature in the Mt Buller Live app. Hot tip: Schuss up to the ski-thru espresso window (at the front of Pension Grimus, off Bourke Street run) for your morning caffeine face-slap.